On An Overgrown Path: Who needs Rob Cowan's bloody rucksack? Who needs Rob Cowan's bloody rucksack? I was interested to read your comments on WFMT Chicago. Thoroughly fed up with BBC Radio 3, I recently bought an internet radio - swiftly followed by a iPod Touch - and it's been a real ear opener to explore some other stations. On WFMT I have been particularly enjoying Andrew Patner and his Critical Thinking programme - also available as a podcast. Hard to describe, usually conversation-based and Chicago-centric, not always music, quite eclectic which is always good, and well worth trying. One difference from Radio 3 seems to be that this is a programme with some integrity. Patner apparently operates without a script on subject matter of his own choice and there is real depth and experience here - he appears to know whereof he speaks, if you like. I've also been noticing some good stuff from ABC National and ABC Classic FM. The former, for example, has a 40 minute book programme every weeknight, again on podcast, as is a weekly philosophy programme. ABC Classic FM has a weekly two-hour religious programme - For the God who Sings (brilliant title) tied to the Christian liturgical calendar, wonderfully presented and containing some glorious music. Unfortunately that's not podcast. There's also a thread on contemporary Australian music. Who needs Petroc Trelawny, Rob Cowan's bloody rucksack and all the other patronising BBC Radio 3 presenters?! 'One difference from Radio 3 seems to be that this is a programme with some integrity' ... the long tail of radio is here. I think you should be a little careful about some of the claims you make. The rankings you point to are clearly not comprehensive (I can tell because my own, Where's Runnicles, would score better than a number of those listed). Like many such sites it appears only to list those blogs that are actively registered with it. Secondly, I object to your assertion that you are "the only prominent UK classical music blogger who does not take paid work from the BBC". As a site that is listed in Creative Tourist's top 25 arts blogs, I think Where's Runnicles meets the prominent criterion and we have never taken paid work from the BBC. 'I think you should be a little careful about some of the claims you make... Like many such sites it appears only to list those blogs that are actively registered with it' - On An Overgrown Path has never been 'actively registered' by me with invesp.com by me. It appeared in their original listings which I assumed were compiled from Sounds & Fury and similar rankings. But if the absence of Where's Runnicles is a problem why not add it rather than complaining to me? I have just checked and it takes a minute to add a new blog. All blog rankings are fallible, no matter how calculated. The consensus seems to be that right now invesp.com is less fallible than most. 'I object to your assertion ... as a site that is listed in Creative Tourist's top 25 arts blogs' - my words were 'I am the only prominent UK classical music blogger' not 'arts blogger'. By no stretch of the imagination can Creative Tourist be said to be a listing of 'classical music blogs' as it includes many purely visual arts blogs. It also includes blogs hosted on sites such as the Guardian which are excluded from most rankings because they are part blog part news site, with attendant high traffic. But good luck with the blog anyway. We need more independent arts and music blogs, wherever they are listed. Re the listings - fair enough. However, given my absence (and various other prominent classical blogs), I assumed it was only those who were registered (I've now added my blog). I quite agree, though, that all rankings, including Creative Tourist's rankings, are never absolute (which was the point I was trying to make - perhaps I could have made it better). While Where's Runnicles is an arts blog, the vast majority of our coverage is of classical music and I would describe myself as a classical blogger as well as an arts blogger. I agree that the Creative Tourist list cannot be described as listing classical blogs, I only mentioned it as illustration that we're prominent. My point is that I view myself as a classical music blogger, one who's reasonably prominent, and I think the statement could be misconstrued. I do very much agree that blog listings shouldn't include blogs on national newspapers which are a different beast altogether. And you've given me food for thought. I might just rename this blog Where's Belohlavek? Whilst I certainly prefer the BBC Radio 3 of 15-20 years ago - better announcers (not Petroc Trelawny) and more listings of the music to be played rather than the 'DJ's name, your anti-BBC postings go too far. It would appear you would rather not listen to the music just because you don't like the announcer/presenters. That is too much like cutting off your nose to spite your face. Considered as a whole the BBC's classical output is vastly more intelligent and wide-ranging than the American stations you quote or other national outputs such as Radio France or Radio Vltava. If the BBC output was cut, and it might be,there would be little chance of it being replaced. It would appear you would rather not listen to the music - please read some of the 2270 posts on this blog over more than five years. Almost everyone is about listening to music. 15-20 years ago much of that music would have been listened to on BBC Radio 3. Today it is a tiny amount. Because the presentation is so awful, and because the music content has been changed to focus on 'crossover' genres, because reading out listener's texts is more important than the music, because the evening concert programmes are driven by timings rather than intelligent selection -http://www.overgrownpath.com/2006/08/bbc-proms-music-and-mathematics.html - and for many, many other reasons, musical and otherwise. If the BBC output was cut, and it might be, there would be little chance of it being replaced - On An Overgrown Path tells a personal story. In my household the BBC output has been replaced, by CDs, webradio, live music and other sources. But through the license fee I still have to pay for 'Radio 2.5'. Like almost every other pro-BBC Radio 3 comment posted here yours is anonymous, so I cannot tell where it comes from. But your webname and the mention of Radio Vltava leads me to assume you are not in the UK. In which case I am delighted BBC Radio 3 meets your needs. But you are not paying for it via a legally enforced poll tax. I am. Which is why criticisms will continue here until things improve, or until the archaic license fee with its lack of accountability is abolished. If that involves cutting the BBC's output, so be it. My argument can be summed up much more succinctly. BBC Radio 3 becomes more and more like Classic FM - which is where Petroc Trelawny and other came from. If Classic FM is available for free, why do we need to pay for BBC Radio 3? I have received another comment from czech56 (who it seems is from the UK) which I am not uploading. It adds nothing more to this topic and starts to adopt a tone I am not comfortable with. Various aspects of BBC Radio 3 cause me problems and I will continue to write about them here on this my personal weblog. Debate is also welcome here. But circular arguments and repetitive comments from an anonymous reader are not going to change my viewpoint and moderating the blog is already taking up too much time. The facility exists at www.blogger.com for anyone to easily create a blog at no cost and express their own views on this and other topics. I look forward to reading czech56's further thoughts there. I am wholly in agreement with all you write on this issue, Pliable, as I have made clear before. I also very much endorse what Graham Hardwick has to say re classical stations elsewhere. I've mentioned in earlier comments that I have classicalwebcast.com bookmarked on my computer. It provides links to over 150 classical stations worldwide, broadly organized by region -- Europe, US, Elsewhere -- and my only problem is choosing which station out of the best: RAI 3, Rete Toscana Classica, Sodre, a host of fine ones from Oslo, Munich, Prague, Hong Kong, Athens...it's an embarrassment of riches. But the point here is that it is also an object lesson in how it can be vastly better done than BBC3 has done it in these recent and dismal years. The CBC here in Canada is considerably worse than BBC 3, so I very much need my internet sources if I'm to go outside my own collection. Philip, many thanks for that. I am aware that I will doubtless be accused of favouring comments that agree with my views, so I am adding a note on the soul-searching that has gone on about how to handle some of the comments on this post. Since starting this blog virtually every comment sent to it (apart from the advertisements and spam) has been published and responded to. Another approach is taken by Alex Ross, who for reasons I fully respect, has never allowed comments on his blog(s). But facts are facts. I do not find parsnips to my taste. Neither do I find much of the output of BBC Radio 3 (and France Musique, Classic FM and a number of other stations) to my taste. On An Overgrown Path is a personal weblog, and I sometimes write about why BBC Radio 3 is not to my taste, although I haven’t yet posted about parsnips. It follows that deluges of increasingly shrill comments (czech56 sent a few more corkers) about my view of BBC Radio 3 is not going to change my taste, although a regime and strategy change at the station almost certainly would do the trick. Similarly please don’t send comments about my lack of appetite for parsnips, genetic engineering is the only solution to that one. Differing points of view have always been welcome here. But they need to be based on relevant experience and add something to the discussion, not simply attack my point of view. And once a differing point of view has been made, repeating it ad infinitum (and responding to it ad infinitum) achieves little except inducing ennui. Yes, many readers think in a similar way to me. That is the definition of a community – a group of people with shared values. Because On An Overgrown Path has become a true community, solely due to you the readers not me, values are often shared. I very rarely use the moderation facility here, and I hope I will not need to in the future. But I want to keep this space and my time free for deserving topics, and will use the moderation facility as appropriate to achieve that. Whilst I find myself in agreement with much of what you say about Radio 3, it is actually not bad value if you live in a household with no television and, therefore, no license fee! 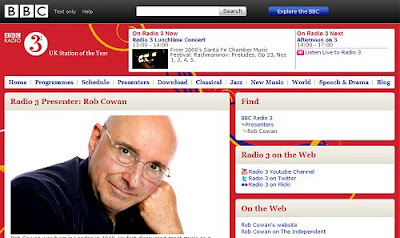 I don't listen to Radio 3 as much as I have perhaps done in the past, but would certainly miss listening occasionally to Late Junction, Jazz on 3, CD Review, Private Passions, the odd Prom etc. Whether the above justifies the cost of Radio 3 is clearly a moot point. A real issue I have is this obsession with the move from analogue to digital. It's strange. Czech56 doesn't have to pay for On An Overgrown Path. But he still doesn't think very much of it. enjoyed reading your blog after stumbling across it. I'm a regular Radio 3 listener, but fed up of its drift towards Classic FM ("Now for another piece of romantic drivel with swirly strings..."). I find the endless Bach, Brahms and Russian romantics annoying. I listen hoping to hear new stuff, be surprised and delighted, not sent to sleep. It speaks volumes that Walton dominates the British Playlist thing on the Breakfast show. I keep texting asking for the likes of Hahn and Koechlin, Baines, Dupont, Dutilleux, Severac, but they don't interrupt the loop.